Still hoping someone somewhere has an “extra” Goshawk–!! Facts: no more permits available for NM birds until next year. Colorado won’t let its birds out. I don’t have a vehicle that would make it to, say, Idaho even if I had no obligations. I haven’t enough money to buy a breeder’s bird outright (though I’d be prepared to pay installments if there are any chamber birds still around). I thought of local passage birds of other species but most of my quarry seems to be in at least some pinon- juniper, which makes it hard for Prairie falcons and Ferruginous hawks. Cooper’s are a remote possibility but are spooked by my intimate living quarters , and small for fur especially jacks. It really gets too cold here in December and january for Harrises. I don’t want a screamer (see”intimate quarters”, or any old pic here) or half- blind WNV survivors, but would consider all other honest offers, and would of course pay shipping (to Albuquerque). It would save my season. Friends of friends anywhere? I find the specificity of (very diverse) categories left in what I must call my “nature” section fascinating. Before there was so much stuff in there that it would have been hard to see categories beyond that vague term. Maybe negative as in “not too much botany or herpetology” though both exist (birds & bugs have their own large sections, much of it fairly technical). English “lyrical” (lousy term but I’ll get back to it– think Pluvialis, Rob MacFarlane, J. A. Baker). Hard evo- bio by scientists who can write (more on this later). Microbiology writing mostly by scientists like Paul Ewald and Robert Desowitz (I have become utterly fascinated with the evolution of disease and parasites since I got malaria in Zimbabwe years ago). Weird bird books, like Maurice Burton’s out of print Phoenix Re- Born about anting (including with fire, which Wiki misses). Off- trail true science, like anything about or by the Dysons (those are two links, for “the” and “Dysons”). Odd anti- romantic nature writing like Tom Palmer’s classic urban herpetology Landscape with Reptile, Jordan Fisher Smith’s spooky Nature Noir, Mary Mycio’s oddly optimistic Chernobyl book Wormwood Forest,and Gordon Grice’s The Red Hourglass. And even po- mo urban compendia like Concrete Jungle by artists Alexis Rockman and Mark Dion (though I don’t necessarily share their politics– I probably have a bleaker view of humans than Dawkins, not a rosier one). Oh, and– everything about dinosaurs especially bird emergence, and everything about the late Pleistocene. Soon– that MacFarlane review and why I generally prefer contemporary Brit nature writing to American– and exceptions & why. In a recent discussion with Chas he spoke of culling his library and I recoiled in horror. I do so in an ongoing context, and I thought there was no need to do any more. Then one restless and sleepless night I was prowling my library and realized that there was a corner I had not been able to reach into for three years, and that, in my natural history and biology/ science section (everything from nature writing to dinosaurs and cladistics), I had not seen the back row in as long except when searching for a particular volume. And I cant even WALK in there. AAARGH! I am a bookoholic! Real past records continue important– my half- wrecked (by the Mongolian airline) and scribbled- in Birds of the Soviet Union from my first Mongolia trip will never go. I am a more enthusiastic bird watcher than ever (arguably NOT “birder” or “twitcher”) but books on birding mostly bore. OUT! At the end of two days I have removed a couple of hundred books. My back hurts, but I can walk around and see my entire nature section. Almost nothing is on the floor, and I am contemplating enlarged shelf space, which I now have the room to put in. I see books I had forgotten, that I need to read again. Ideas are popping into my head. I realize that I had begun to dread the chaos of the library, and that now I can enjoy it again. Sounds like a great time, doesn’t it? I was surprised that I had never heard of this as I used to live in Sonora, the town immediately to the south of Columbia. Apparently this annual celebration began after I left in 1980. All I can say is this is probably tied with Frozen Dead Guy Days for Best Original Quirky Small Town Festival Theme. 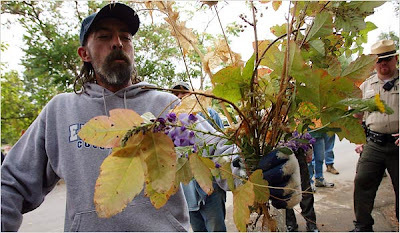 The NY Times has provided a slide show of the Poison Oak Show here. 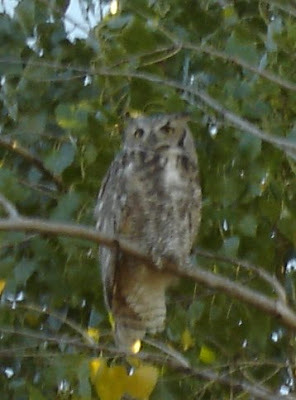 I saw this Great Horned Owl while driving home from work yesterday afternoon. He (she?) 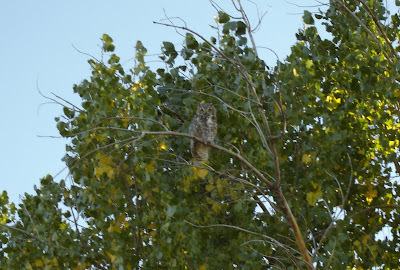 was hanging out on a cottonwood limb waiting to fly out and hunt for breakfast. Connie and I had seen this fellow several times over the last couple of months. These birds are so big they really stick out. Here’s a closer shot, pretty near the limits of our little point and shoot. I’m sure the Bayou Gulch bottoms where he was located provide good hunting. We had sort of a staring contest for a few minutes. Finally he was sick of it and flew to the next tree where he perched on a limb with his back to me. Perhaps such attacks are not too surprising in a state that has an alligator population of over one million and a human population of nearly 19 million, but it turns out that they are not necessary. You see, you can have a LOT of alligators and no attacks on humans. That’s the score in Louisiana. The reason: unlike Florida, Louisiana encourages licensed hunting of alligators, and alligator hunters go after the largest alligators in the easiest-to-find locations, i.e. the ones that are most likely to attack people and pets. Louisiana actually has more alligators than Florida, but Louisiana alligators have never killed a human in that state’s recorded history, while 11 people have been killed by alligators in Florida since 2001 alone. The secret to Louisiana safety is that state’s legalized hunting and harvest program called “Alligator Marsh to Market.” [snipped] In truth, of course, alligators are not huge killers of people. In Florida, alligators kill fewer people than swimming pools and lawn mowers. That said, the number of alligator attacks in Florida is on the rise, from 78 people in the 1980s, to 159 people in the 1990s, and 97 people in the five years between 2000 and 2005 (suggesting about 200 attacks can be expected in the first decade of this millennium). Reid asked for my take on this as one who lives in Louisiana and used to live in Florida. I agree that controlled alligator hunting (and also trapping of nuisance animals) plays a part in reducing attacks on humans, but note that Florida has an alligator harvest program, too, running since 1988. According to Florida Fish & Wildlife Commission data, almost 23,000 alligators were legally harvested in the state between 2000 and 2006. When I worked for FWC, I shared an office suite with the state harvest coordinator, a very smart and affable man who really knew his gators. I remember well the alligator habitat map posted on his wall: It basically blanketed the state of Florida, pockmarked as it is by hundreds of thousands of bodies of fresh water, more or less evenly distributed. Gator hunting opportunities are widespread in the Sunshine State. So I look elsewhere for the difference between the Florida and Louisiana experiences of living with alligators. My guess is that if Louisianans suffer fewer alligator attacks, it’s likely because more Louisianans are “natives,” whose families have four or five generations of local history, if not more. Alligator lore is widespread in Louisiana and woven into its folktales, family memories and its recipes. The people who encounter alligators here are more likely to know something useful about them. The situation in Florida is different, of course. There are relatively fewer natives and more recent immigrants. And the development of real estate differs, too, as anyone knows who has driven south on I-75. Florida is basically a huge suburb, except where it is a huge city. There are pockets of wild land left, much of it managed by the state, and some surprisingly beautiful cattle country surviving from the Cracker era. But for the most part, people are as evenly distributed in Florida as the alligator habitat and the gators themselves. Since much of the human landscape is suburban, suburban people (actually urban people who commute) share lots of space with large, hungry reptiles. With such an urbanized population of newcomers living in an ancient, epoch-spanning gator-pit, I’m surprised more Floridians and their pets are not eaten than are. Louisianans, by contrast (though this is changing fast) live either in cities proper or tidy small towns, or the countryside. The suburban model of housing development is a relatively recent fixture here. Traditionally in Louisiana, those who might know least about alligators lived in places where they would rarely encounter one. But a conclusion to that effect was drawn from research published recently in the (online) Proceedings of the National Academy of Sciences. The research…reveals that humans today are hard-wired to pay attention to other people and animals much more so than non-living things, even if inanimate objects are the primary hazards for modern, urbanized folks. anew and that’s why this is left over from our past,’ said study team member Leda Cosmides, an evolutionary psychologist at the University of California, Santa Barbara (UCSB). Immersed in a rich, biotic environment, it would have been imperative for our ancestors to monitor both humans and non-human animals. Predators and prey took many different forms—lions, tigers and bears—and they changed often, so constant eyeballing was critical. While the environment has changed since then, with high-rises emerging where forests once took root and pampered pets taking the place of stalking beasts, our instinct-driven attention has not followed suit. ‘Having this pop-out attentional bias for animals is sort of a vestigial behavior,’ said study team member Joshua New of Yale University’s Perception and Cognition Lab. New’s conclusion is based on the measured speed and accuracy with with test subjects correctly identified changes to projected scenes of animate and inanimate objects: Subjects tested better at identifying changes when people and animals were present. This study should surprise no one, not even “modern, urbanized people” in more danger from large cars than from large animals. Certainly everyone in advertising knows that people stare at other people and at animals. How many commercials can you recall that don’t feature either? Cutout ads for wheelbarrows and car tires can run without a smiling face or a puppy, but those are pricepoint appeals to the head. When the goal is basic, visceral reaction—heart and gut—smart ads feature emotive people and cuddly or cool-looking animals. Consumers of great literature will concur. How many classic stories can you name with neither people nor animals in them? And how many have both? The preponderance of people, plants and animals in other works of art is obvious. Isn’t it, in fact, the absence of these familiar subjects that partly defines “abstract” art, and partly what makes it a challenge for many to enjoy? Despite the curious conclusions of some, human interest in living things is hardly comparable to our appendix or coccyx—it is central to the human condition. What else is there? Should we fall in love with buildings or keep telephones as pets? 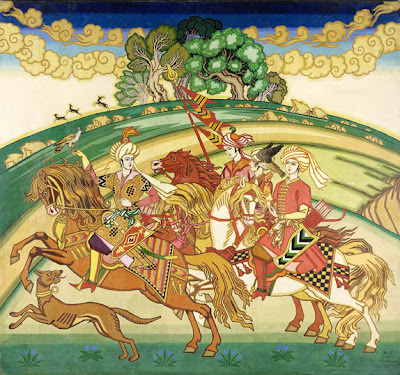 Artist friend Nance McManus sent me this wonderful image by the 20th century Russian artist Ivan Bilibin. I wasn’t aware of him, but there is a lot on Wiki here, including many wonderful paintings and other images. I won’t be owning one soon– Sotheby’s asking price for “The Hunt” was in the middle hundreds of thousands of pounds. … from Phillip Grayson, who will soon be reporting from Poland. The first thing one should do on arriving in Istanbul is hop in a cab and head to your hotel in Taksim, the downtown heart of cosmopolitan Istanbul. There are cheaper hotels in the center of the tourist district, and you’ll probably want to stay there the bulk of your trip, but on this first night in town you need to go all the way into the belly of the beast. Taksim itself is nice enough, crawling with shops and well-stocked with an endless supply of basically-pretty-similar bars and restaurants, but that’s all beside the point. Before you even arrive there, the best part of your visit may well have already taken place. The airport is on the outskirts of the European side of the city, and the road that winds from it to your overpriced hotel will take you along the seaside for several miles, giving you plenty of time to take in the manicured parks that line the shore and the warships, freighters and cruise ships that commiserate in the harbor, as well as schizophrenic piecemeal architecture that defines the majority of the city, houses cobbled together and repaired as they required it, and not a bit more. An apartment building, for example, may date back to the mid-70s for the first two or three floors, and then have a few more above them about a decade younger, with a single wall that came in after the earthquake and a brand spankin’ new roof. You’ll also get a chance to see a few of the “historical” wooden houses of Istanbul, dilapidated and slowly collapsing, these cannot be torn down, so even later, as you cruise down the Bosphorus toward the Black Sea, you’ll see a couple stuck in amidst the modern mansions in a sort of scaled-up version of these cut-and-paste apartments in the suburbs. You’ll turn away from the seaside just before you begin approaching the Bosphorus, which separates Europe from Asia Minor, guarded over by Topkapı palace and a few thousand tourists. Instead you move straight toward the Golden Horn, the inlet that runs into the European side of the city, and which, as you cross it, will be lined with Mosques, filled with jellyfish and a few fountains, and crossed over by two long bridges full of fishermen. Before you even get there though, with an almost alarming suddenness and grandeur, as you emerge from an underpass, an Ancient Roman aqueduct reminds you that, for all the natural beauty you’ve seen and will see, this is a human city, fought over and fortified and overpopulated and restructured in sometimes amazing ways to perfect it away from whatever nature’s original intent might have been. On the other side of the Golden Horn you ascend one of the seven hills the city was built on (and what is it with building cities on seven hill?) and get the best possible view of Istanbul, looking over the sprawling, undulating city, either decked out in a million lights of surprisingly varied colors, or scorched by the sun to something so perfectly exotic and massive as to make reality seem just a little less stable. Immediately after this world-class tableau, on the right, is a street and runs away from you and is filled, completely, top to bottom, end to end, with nothing but chandeliers, small chandeliers, big chandeliers, gigantic chandeliers, cheap chandeliers, expensive chandeliers, a chandelier to suit any mood, budget and home, believe you me, all lit and undeniable and designed, it would seem, to shatter your newly enfragiled sense of reality. It could well be the most bizarre thing I’ve ever seen (and I’ve seen the Grand Bazaar). With that pesky sense of equilibrium out of the way, you’re now in Taksim, whose main road, ostensibly pedestrian despite the dozens of cars and motorcycles honking their way through the thronged crowds, is said to see almost a million sets of feet every day. There are McDonalds and Pizza Huts and Burger Kings aplenty, but you’ll want to try some authentic Turkish cuisine, but beware, because Turkish food is Greek food without pork or sauces, and your already repeatedly affronted, oh so delicate sense of reality might not be able to fight of the sense that there is much better Turkish food in America than there is in Turkey. Try not to think about it too much. Keep your wits about you and step back out into flood of humanity that is I_tiklal Sokak remembering these last few things: the men arm in arm are not gay, it is not rude to walk (or drive) directly into someone without apology or hesitation, you don’t want to buy perfume off the street, and once your luggage has been successfully lost, the best part of your trip is over, you will never be this disoriented again, so you might as well take a nap. A book review (Rob MacFarlane’s The Wild Places). Why public land ranching has one major environmental GOOD effect. Related: while it is good to bring back wolves it is also good to kill (some of) them; and why how you reintroduce them is also important.